이 책은 당나라의 반야삼장이 한문로 번역한『화엄경』정원본 40권 중 권 제24인데, 방대한 분량의 화엄경에서 보현행원품만을 따로 분리시킨 것이다. 내용은 보현보살이 깨달음의 세계로 들어가기 위한 10가지 방법을 설법한 것이다. 닥종이에 찍은 목판본으로 병풍처럼 펼쳐서 볼 수 있는 형태로 되어있으며, 크기는 세로 30.5㎝, 가로 12.3㎝이다. 검푸른 남색의 표지에는 금·은색의 꽃무늬가 장식되어 있고, 그 가운데 제목이 금색으로 쓰여 있다. 그리고 그 아래에 정원본임을 표시하는 ‘정(貞)’자가 금색으로 쓰여 있다. 이 책은 해인사고려각판(국보 제206호)에서 찍어낸 것으로, 판을 새긴 시기는 12∼13세기로 추정되며, 찍어낸 시기는 표지장식·종이질·인쇄상태 등으로 볼때 14세기경으로 추정된다. Avatamsaka Sutra is one of the canonical scriptures of Mahayana Buddhism; the central idea expressed in this sutra is the unity of Buddha and sentient beings. As the most fundamental text for Korean Buddhism, this sutra has had seminal influence on Korean Buddhist philosophy along with the Saddharmapundarika Sutra (Lotus Sutra). 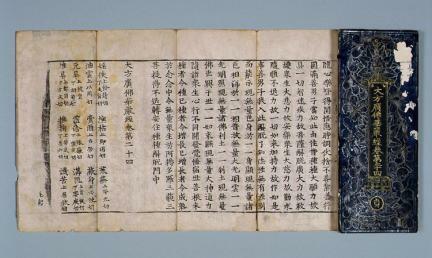 This book is Volume 24 of the 40-volume Avatamsaka Sutra translated by Banruo of the Tang Dynasty. 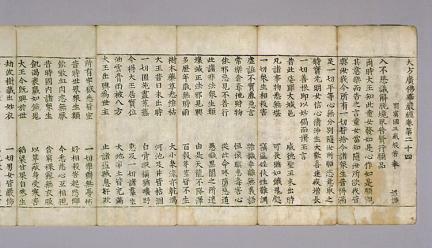 Printed on mulberry paper using woodblocks, the book measures 12.3 cm wide and 30.5 cm long when folded. The title of this book is written in gold on the dark blue cover, which is decorated with flower designs in gold and silver. The Chinese character “貞” indicates that this book is the Zhenyuan Version of the sutra. This book was printed with the Printing Woodblocks of Miscellaneous Buddhist Scriptures in Haeinsa Temple, Hapcheon (National Treasure No. 206), and the production date of the woodblocks is believed to be around the 12th ~ 13th century. The book is presumed to have been printed in the 14th century, judging from the decorations on the cover, quality of the paper, and printing condition.